Up your tech-on-the-go game with these new luxury gadgets. French luxury goods behemoth Louis Vuitton has put an end to seething by the carousel with its new Echo luggage tracker. Measuring about 10cm long, 2cm wide and just 1cm deep, the stylish gadget keeps tabs on your Tambour Horizon bag, the luggage line Echo is designed to work with. As your bags travel from the plane through the airport, the Echo sends data via radio frequency to your phone. A built-in light sensor also detects if your luggage has been opened. The Sigfox-powered device boasts a six-month battery life and works in conjunction with the LV Pass app. Five years after revolutionising aerial photography with the Phantom, tech giant DJI has again caused shockwaves with its newest, lightest and most powerful drone yet: the compact Mavic Air. No bulky drone case is needed for this one, as the 430-gram gadget can be folded to the size of a smartphone and slipped into your back pocket. It might be small but it packs plenty of punch, featuring a three-axis gimbal camera, 4K video recording, 32-megapixel panoramic photo-taking and an upgraded obstacle avoidance system. Sleek aesthetics come standard from Leica, but the cult German camera manufacturer’s latest offering, the special edition Leica Q Snow takes it to the extreme with a white-and-silver colour scheme, a new aluminium shoe cover, anodized plates, and a matching leather-clad chassis, case and strap to boot. Designed in partnership with Swiss photographer Iouri Podladtchikov, an Olympic gold medallist in snowboarding, the high-performance compact camera boasts a full-frame image sensor, fast 28mm f/1.7 lens, built-in 3.68-megapixel electronic viewfinder and Wi-Fi connectivity. The Snow is limited to just 300 pieces worldwide. Among the standouts at this year’s Baselworld was British watchmaker Arnold & Son’s first model with a world-time complication, the Globetrotter. Inspired by the marine chronometers created by founder John Arnold and his son in the 18th century, this modern-day reimagining features one of the world’s largest rotating 3D world-time displays on a wristwatch. Housed in a 45mm stainless steel case, powered by an automatic movement developed in-house, and boasting a 45-hour power reserve, the water-resistant timepiece is sure to be popular with intrepid travellers. 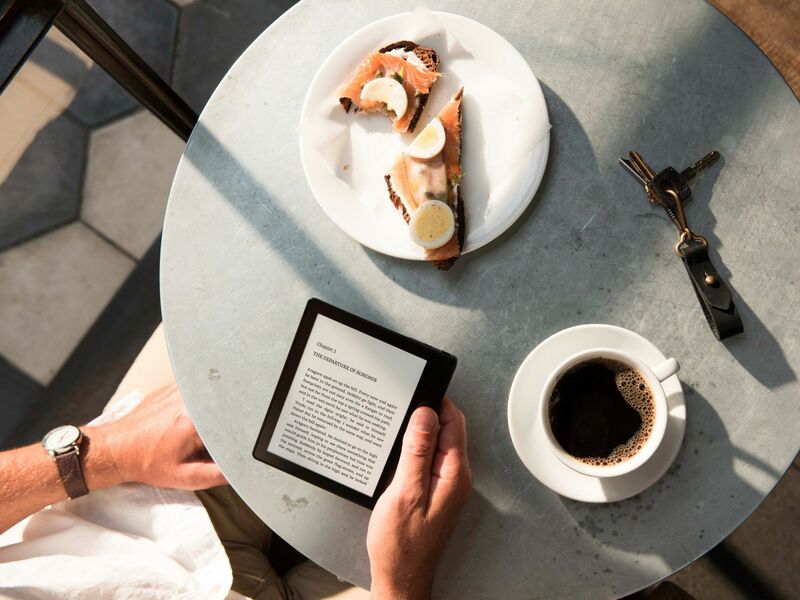 With its chic champagne-gold aluminium case, the latest edition of Amazon’s premium e-reader may be what it takes to tear traditional bibliophiles away from paper books. It’s equipped with all the powerhouse features of the original Oasis, including a crisp 18cm, 300-ppi display, built-in Audible support, an adaptive front light and an ergonomic 3.4mm waterproof body. With 32 gigabytes of storage, the stylish gadget is a library in your pocket, enabling you to carry all the novels, magazines, comics and audiobooks you would need for any excursion. No more fumbling with your phone—or worse, missing moments in favour of capturing them—with the messaging company’s flagship smart accessory, Snapchat Spectacles. Slimmer, chicer and faster than the 2016 original, the newly released version 2.0 hands-free wearable camera echoes its signature quirky design yet delights with its finer craftsmanship, water-resistant hardware and more sophisticated hues of onyx black, ruby red and sapphire blue. With simply the tap of a button, HD images, audio and 10- or 30-second videos are captured through your glasses and shared immediately on your Snapchat account. Known for its elegant, minimalist designs and eye-popping hues (last year’s millennial pink collection sold out almost immediately? ), New York-based smart luggage company Away is back with a limited edition range designed in collaboration with model Karlie Kloss, with all sales benefiting Kloss’ female-empowering non-profit, Kode With Klossy. Available in tech-inspired colours dubbed gigabyte green, pixel purple and binary black, the polycarbonate, nylon and vegan leather-clad suitcases and accessories come equipped with USB chargers, a built-in battery, Bluetooth location tracking via the Away x Tile luggage tag and interior laptop sleeves to ensure the savvy traveller stays connected en route.